The Minsk II accords are nothing more than a tenuous ceasefire in a tense regional neighborhood, and the sincerity of France and Germany’s intentions is dubious, at best. While the US has yet to formally commit to arming Ukraine, it still holds the option open and can unilaterally do so with or without EU support or ongoing hostilities. While Paris competes with Germany ‘domestically’ within the EU, it complements it in terms of regional foreign policy in order to piggyback off of Berlin and acquire an increased profile and some residual prestige. Be that as it may, France closely cooperates with the US in West/Central Africa, and this relationship is not worth abandoning in order to all-out reject American designs in Ukraine, which Paris sees as being more within Germany’s sphere of influence/responsibility anyhow. Most observers are already aware of Germany’s enormous trade ties with Russia, so it’s not necessary to rehash them at this point. Instead, attention should be drawn to Merkel’s rumored personal ambitions to be the next UN Secretary General, which could help explain her near-useless, albeit symbolic, merry-go-round diplomacy to Kiev, Moscow, Munich, and Washington. Aside from that, Berlin cynically appreciates the US’ anti-Russian fear mongering that has resulted in devastating counter-sanctions against eastern/southeastern EU member states, since it makes their economies more dependent on Germany and thus entrenches its power even deeper in the union’s poorer and more peripheral states. The narrative that the EU can somehow prevent the US from equipping Ukraine with lethal weapons, either through its political resistance to such a plan or by ‘bringing peace’ to Ukraine first, is unequivocally false. It’s the US that tells the EU what to do, not the other way around, and the US will deliver weapons to Kiev regardless of what the EU thinks about the issue. As proof of America’s unilaterally aggressive actions in the face of the EU’s diplomatic rhetoric, the commander of US Army Europe, Ben Hodges, announced on the eve of the Minsk II talks that the US military will be training 600 members of Kiev’s armed forces, showing that it could care less about whatever the EU is doing for ‘peace’. 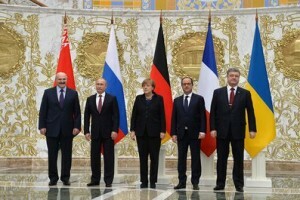 Even if such a distant scenario developed where the EU attempted to pressure the US on the issue and was resolute with its stance, it would in reality only be France, Germany, and a handful of others who would engage in this resistance, since Poland, the Baltic States, and Romania are completely supportive of the US’ anti-Russian policies in the region. With the EU already torn between north and south, it’s not likely that Merkel would want to risk dividing it into east (anti-Russian) and west (pragmatic towards Russia), too. This brings one to the final point, which is that Russia’s western neighborhood is absurdly hostile to it and openly embracive of Russophobic policies. Be it Poland, the Baltic States, or Romania, these countries’ elites feel they have a bone to pick with Moscow and are intent on drawing the US into their spats. By internationalizing their bilateral problems and getting a superpower involved on their side, ‘minor-league’ states and their regional foreign policies become caught up in Great Power politics and are thus elevated to global significance, which ultimately serves their subjective, self-interested goals. It goes both ways, however, since the US also uses them to achieve its own objectives in the region, which in this case, may be about using Poland and Romania as proxies for arming Kiev. Thus, so long as the zeitgeist of those states remains as radically anti-Russian as it is today, then they will always be involved with instigating some level of conflict with Russia and requesting the US’ assistance in resolving it.